Esophagus is a narrow muscular tube extending from pharynx to the stomach. It gives passage for chewed food (bolus) and liquids during the third stage of deglutition and is about 25 cm long. Its engagement in different diseases like esophagitis, esophageal varices and cancer makes the anatomy of esophagus medically significant. It begins with lower part of the neck and ends in the upper part of the abdomen by joining the upper end of the stomach. Length: 25 cm (10 inches). Lumen: It’s flattened anteroposteriorly. Normally it’s kept closed (collapsed) and opens (dilates) only during the passage of the food. The esophagus begins in the neck at the lower border of the cricoid cartilage (at the lower border of C6 vertebra), descends in front of the vertebral column goes through superior and posterior mediastina, pierces diaphragm in the level of T10 vertebra and ends in the abdomen in the cardiac orifice of the stomach in the level of T11 vertebra. First at the root of the neck, before entering the thoracic inlet. Second at the level of T7 vertebra, before passing in front of the descending thoracic aorta. First corresponding to the curvature of cervical spine. Second corresponding to the curvature of thoracic spine. First constriction, at the pharyngo-esophageal junction, 9 cm (6 inches) from the incisor teeth. Second constriction, where it’s crossed by the arch of aorta, 22.5 cm (9 inches) from the incisor teeth. Third constriction, where it’s crossed by the left principal bronchus, 27.5 cm (11 inches) from the incisor teeth. Fourth constriction, where it pierces the diaphragm, 40 cm (15 inches) from the incisor teeth. Cervical part (4 cm in length). 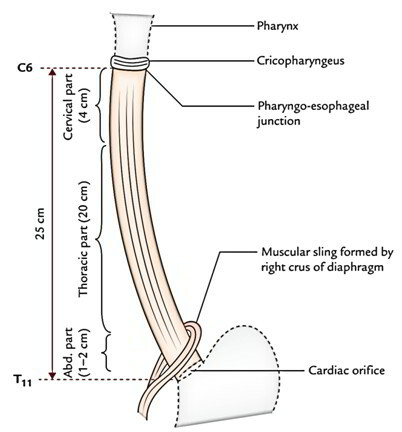 Thoracic part (20 cm in length). Abdominal part (12 cm in length). The cervical part extends from the lower border of cricoid cartilage to the superior border of manubrium sterni. The thoracic part extends from superior border of manubrium sterni to the esophageal opening in the diaphragm. The narrowest part of esophagus is its commencement at the cricopharyngeal sphincter. The abdominal part extends create esophageal opening in the diaphragm to the cardiac end of the stomach. The prevertebral layer of deep cervical fascia creates a movable base on which the trachea and esophagus move up and down during swallowing and phonation. Left atrium enclosed in the pericardium. Posterior surface of the left lobe of the liver. The abdominal part of esophagus is shortest (1 to 2 cm long) and is the only part covered with serous membrane – the peritoneum. A. Blood supply to the cervical part is by inferior thyroid arteries. B. 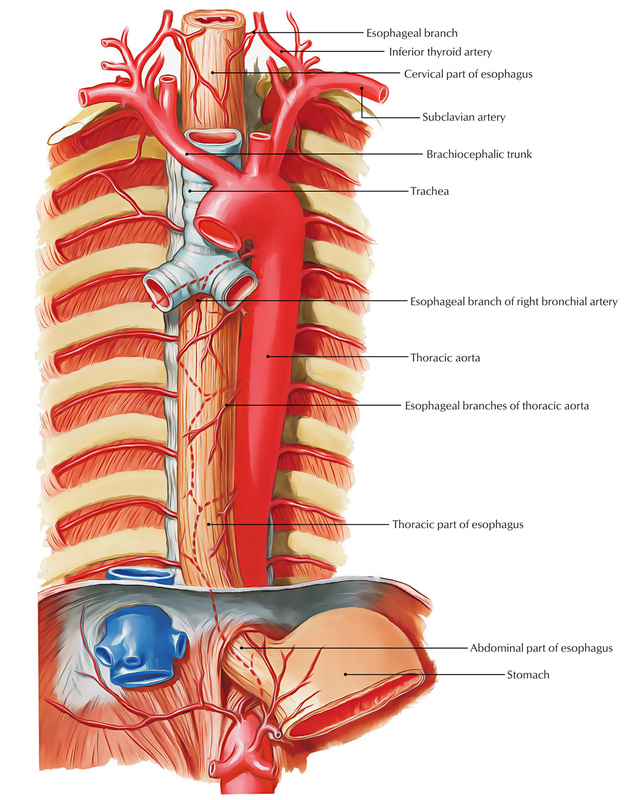 Blood supply to the thoracic part is by esophageal branches of Descending thoracic aorta, and Bronchial arteries. C. Blood supply to the abdominal part is by esophageal branches of Left gastric artery, and Left inferior phrenic artery. A. Cervical part is drained by inferior thyroid veins. B. Thoracic part is drained by azygos and hemiazygos veins. left gastric vein, a tributary of portal vein. Thus abdominal part of esophagus is the site of portocaval anastomosis. A. From cervical part, the lymph is drained into deep cervical lymph nodes. B. From thoracic part, the lymph is drained into posterior mediastinal lymph nodes. C. From abdominal part, the lymph is drained into left gastric lymph nodes. The esophagus is supplied by both parasympathetic and sympathetic fibres. The parasympathetic fibres are originated from recurrent laryngeal nerves and esophageal plexuses created by vagus nerves. They supply sensory, motor, and secretomotor supply to the esophagus. The sympathetic fibres are originated from T5-T9 spinal segments are sensory and vasomotor. It’s composed of the following components:. A. Epithelium – highly stratified squamous and non- keratinized. B. Lamina propria – contains cardiac esophageal glands in the lower part only. C. Muscularis mucosa – very-very thick and created from only longitudinal layer of smooth muscle fibres. It includes mucous esophageal glands. A. In upper 1 -third, it’s created from skeletal muscle. B. In middle 1 -third, it’s created from both skeletal and smooth muscles. C. In lower 1 -third, it’s created from smooth muscle. It is composed of dense connective tissue that has many elastic fibres. A clinical condition at which stratified squamous epithelium of esophagus is replaced by the gastric epithelium is referred to as Barrett esophagus. It may result in esophageal carcinoma. Separation of laryngotracheal tube by the formation of laryngotracheal septum. The failure of canalization of the esophagus leads to esophageal atresia and maldevelopment of laryngotracheal septum between the esophagus and trachea leads to tracheoesophageal fistula. The left margin of the esophagus projects laterally from behind the trachea in the region of the neck. Thus the cervical part of esophagus can be marshalled and exposed surgically more easily from the left side. The inner part of the esophagus can be examined in vivo by esophagoscope. This process helps to get tissue biopsy or removal of swallowed foreign body. The lower end of esophagus is 1 of the significant sites of portocaval anastomosis. In portal hypertension, example, because of the cirrhosis of liver there’s back pressure in portal circulation. Because of this, collateral channels of portocaval anastomosis not only open up but become dilated and tortuous to create esophageal varices. The ruptured esophageal varices cause hematemesis (vomiting of blood). In the esophageal aperture of the diaphragm, the left vagus nerve (now referred to as anterior gastric nerve) is related anteriorly and right vagus nerve (now termed posterior gastric nerve) is related posteriorly. The pain sensations mostly originates from the lower part of the esophagus as it’s susceptible to acid-peptic esophagitis. Pain sensations are carried by sympathetic fibre to the T4 and T5 spinal segments. For that reason, esophageal pain is referred to the lower thoracic region and epigastric region of the abdomen, and at times it becomes difficult to differentiate esophageal pain from the anginal pain. These are the sites where swallowed foreign bodies may stuck in the esophagus. These are the sites where strictures develop after ingestion of caustic substances. These sites have predilection for the carcinoma of the esophagus. These are sites via which it might be difficult to pass esophagoscope/gastric tube. It’s performed to detect (a) enlargement of the left atrium because of mitral stenosis, (b) esophageal strictures, and (c) carcinoma and achalasia cardia. In normal case, the barium swallow examination presents 3 indentations in its outline caused by the aortic arch, left principal bronchus, and left atrium. It’s performed to visualize the interior of the esophagus while passing esophagoscope, the sites of normal constrictions ought to be kept in mind. It’s a clinical condition where sphincter at the lower end of esophagus fails to relax when the food is swallowed. Consequently food accumulates in the esophagus and its regurgitation takes place. This condition takes place because of neuromuscular incoordination, probably because of congenital absence of ganglion cells in the myenteric plexus of nerves in the esophageal wall. A radiographic barium swallow evaluation of the esophagus reveals a characteristic birds beak/rat tail appearance. Narrowing of lumen because of stricture or carcinoma. It’s a commonest congenital anomaly of esophagus which takes place because of failure of separation of the lumen of tracheal tube from that of esophagus by a laryngotracheal septum. In the most commonest type of tracheoesophageal fistula, the upper esophagus ends blindly and lower esophagus interacts with trachea in the level of T4 vertebra. Medically it presents as: (a) hydramnios because fetus is unable to swallow amniotic fluid, (b) stomach is distended with air, and (c) infant vomit every feed given or may cough up bile. The fistula must be closed surgically to avoid passage of swallowed liquids into the lungs. They most commonly take place in its lower one-third. The lymph vessels from lower 1/3rd of the esophagus descend via the esophageal opening of the diaphragm and drain into the celiac lymph nodes around the celiac trunk. A malignant tumor from lower 1/3rd of esophagus, for that reason, spreads below the diaphragm into these lymph nodes. Consequently, surgical resection of the lesion consists of not only the primary site (i.e., esophagus) but also celiac lymph nodes and all the regions that drain into these lymph nodes like stomach, upper half of the duodenum, spleen, and omenta. The continuity of gut is restored by performing an esophagojejunostomy. What type of epithelium lines the lumen of the oesophagus? Approximately how long is the oesophagus? At what vertebral level does the oesophagus originate? In which section of the oesophagus does the external longitudinal layer of muscle contain both voluntary striated and smooth muscle? The gastro-oesophageal junction occurs at which vertebral level? What type of cellular adaptation is seen in Barretts Oesophagus?